I couldn't have done it without the support and help of many people! I especially want to thank my advisor (Alfred Kobsa), committee members (Bonnie Nardi, Don Patterson), collaborator and stats mentor Bart Knijnenburg and all of my wonderful colleagues and past instructors in my home department, Informatics, as well as those in Computer Science, Sociology and Social Ecology! I am happy to announce that I will be joining the faculty at Bentley University as Assistant Professor in Computer Information Systems. 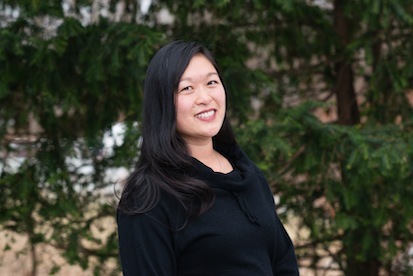 I look forward to working in the Boston area and with a network of bright and supportive colleagues! University of California, Irvine has chosen my dissertation as its nominee for the 2015 iConference Doctoral Dissertation Award. The iConference is organized by the iSchools organization which is a quickly growing collection of Information Schools that share a "fundamental interest in the relationships between information, people, and technology". The winner will be announced in March 2015. I've successfully defended and submitted my dissertation. I am graduating with a winter 2014 degree, a doctorate in Information and Computer Science. Thanks for all of the support from my colleagues and mentors! I just received the Yahoo! Best Dissertation Fellowship Award for my research "in identifying and measuring psychological and social factors that impact people's behaviors and attitudes towards location-sharing technology". Thanks to the people at Yahoo! 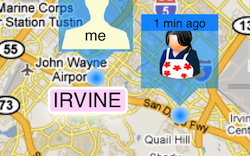 who are doing exciting work in the location-based services and personalization areas. 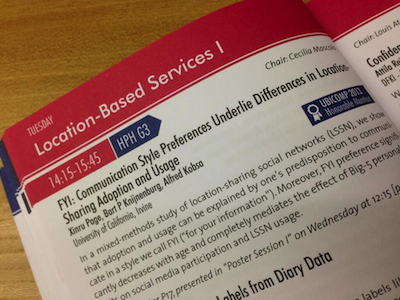 On the same day, I found out that my paper about communication style personality traits and location-sharing adoption and usage styles was nominated for best paper at UbiComp 2013. Thanks and congratulations also to my coauthors Bart Knijnenburg and Alfred Kobsa!